Badaling Great Wall is the most representative section of China Great Wall. Badaling tour guide with pictures, admission fee, opening hours, how to get to Badaling information. The Great Wall is a symbol of Chinese civilization, and one of the wonders that the Chinese people have created. Badaling Great Wall, the most representative part, was promoted as a key national cultural relic, protected under the approval of the State Council in 1961. In 1988, it was enlisted in the World Cultural Heritage Directory by UNESCO. 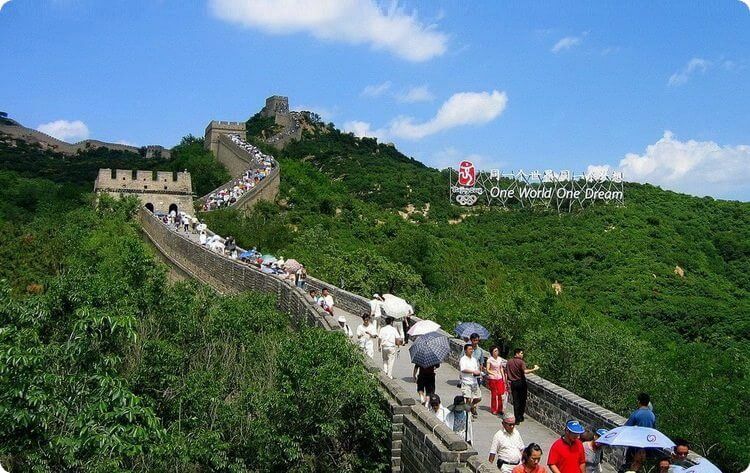 July 7, 2007 has once again witnessed the worldwide reputation that the Great Wall gained: it was listed among the New Seven Wonders of the World. Badaling Great Wall is situated in Yanqing County, over 70 kilometres (43 miles) north of Beijing. It is the most well-preserved section of the Great Wall, built during the Ming Dynasty (1368-1644). This section with an average altitude of over 1,000 meters (3,282 feet) is the outpost of the Juyongguan Pass. The mountain slope is very steep and the roads are tortuous. These features made it a military bhold. Badaling Great Wall is like a b dragon winding its way along the mountain ranges. The Great wall originally functioned as a fortification. 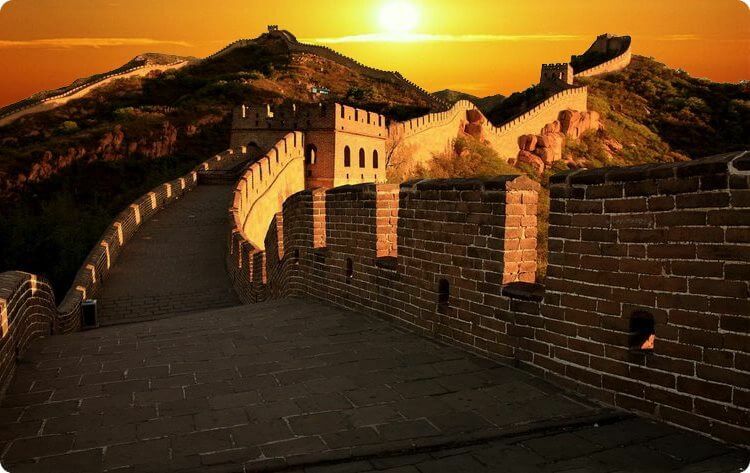 As early as the Qin Dynasty, Qinshihuang, the first emperor of Qin Dynasty unified the whole nation and began to build the Great Wall to protect China’s borders from the intrusion of the northern nomadic tribes. Most parts of the preserved Badaling Great Wall were built and reinforced during the Ming Dynasty to defend the capital against the intrusion of these Mongolian people. The structure of the wall consists of huge bar-stones and bricks. The inside of the wall has been formed by tampering earth and small stones, which makes the wall very firm and b. Internally, the wall is about six meters (20 feet) wide, which would allow horses to gallop five abreast. A number of small holes have been drilled on the wall to allow archers to shoot arrows. There is a barrel-drain and a moat both inside and outside the wall. In a word, military fortification has been paramount in the consideration of every wall detail. As a landmark erected at the top of a group of mountain ranges, Badaling Great Wall has also witnessed many significant historic events. The first emperor of the Qin Dynasty toured there, Yuan Taizu, the first emperor of Yuan Dynasty (1271-1368) passed the Badaling Great Wall and took control over the whole of China. Empress Cixi fled from there to the western part of China in 1900 when an alliance of eight western countries invaded Beijing. At present, Badaling Great Wall stands still there recording the hardship and bitterness that Chinese people have endured in the past 2000 years. It is a priceless cultural heritage of humanity. Badaling Great Wall was the earliest part of the great Wall opened to tourists. It has drawn tens of millions of tourists both from home and abroad. More than 370 foreign leaders and celebrities have visited there. The Badaling Great Wall, constructed in 1502 (during the Ming Dynasty), once served as a crucial military fortification, and is now the most impressive and representative section of the striking Great Wall. It is located in Yanqing County, about 70 kilometers (43.4 miles) from the downtown area of Beijing. 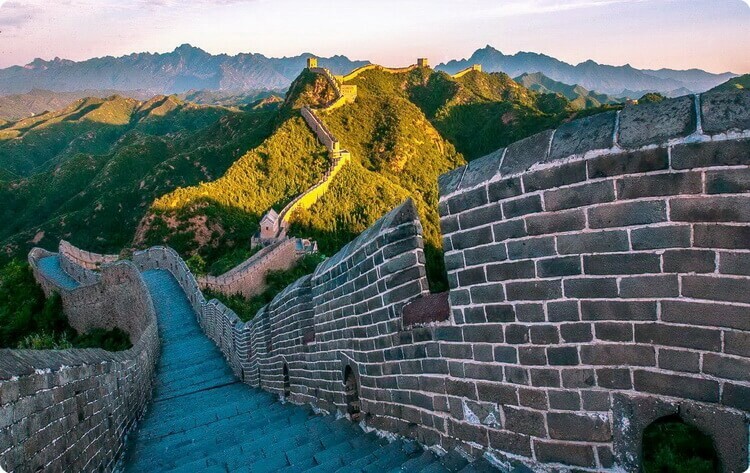 Twisting and turning at an altitude of 1,000 meters (3,281 feet), the Badaling Great Wall appears exceptionally lofty on the undulating mountains. It is an architectural marvel that has been praised by many leaders, from China and around the world. Both Richard Nixon and Margaret Thatcher visited this section of the wall, and in 1987 it was placed on the World Heritage List of UNESCO, a list reserved for destinations considered to have outstanding universal value. As Badaling was once an important military strategy point, here the wall is comparatively high and firm. It has a length of 3,741 meters (2.3 miles) and it is equipped with dense watchtowers. The wall is about 8.5 meters (27.9 feet) high and slopes inward as it rises in height. The wall is 6.5 meters (21.3 feet) wide at its base, and its rim spans about 5.7 meters (18.7 feet) across. The wall’s exterior is composed of large granite slabs that surround layers of loess and gravel. Its coping is made of large bricks that provide a smooth walkway, wide enough for ten people to easily walk side by side. A parapet on the coping once provided a defense barrier against assailants. Great Wall at Badaling in BeijingCrenellated battlements decorate the parapet’s exterior. In the battlement, there are square holes, from which soldiers had an outlook and shot at the enemy. Two-storey castles lie approximately every 400 meters (about 1,312 feet) on the wall. The castle’s second floor gave soldiers an additional advantage over attackers; the arched cavity below was used to store artillery and also doubled as a simple dormitory for the watchmen. A number of high beacon towers were built so that when the enemies invaded, signals could be sent out to call for reinforcement. 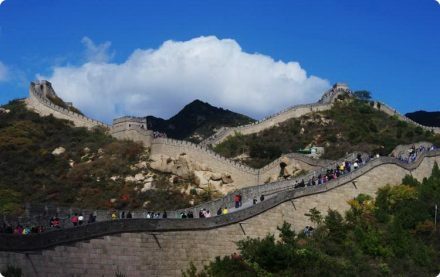 While the Badaling Great Wall has not served as a military fortification since the Qing Dynasty (1644-1911), it now hosts a number of modern attractions, including a Great Wall Museum and a Great Wall Cinema. The museum and cinema both provide information about the history and culture of the Great Wall. Tour guide is too professional, This journey saves a lot of time. Our family can take photos slowly on the Great Wall and enjoy the autumn scenery.